Like a beautiful rose the Spiritual Road has its Thorns some hurt really bad, some not much, you only have to learn how to grab them without causing you any damage on your Soul. When looking for awareness, we go through times when don't know what to do or where to go, Spiritual lessons can be too harsh and hard that make you think of quitting, on leaving all behind and forget about it. One thing I have learned from being on this Road is that the more one tries to quit sooner or later one comes back to finish the lesson whatever this was… there is not return there is not turning back or walking away once you started you have to finish. A friend of mine Graciela my Spiritual Teacher too. She used to tell me “you will see… the more you meditate you’ll see the changes one of them will be your sleeping time that is your Spirit looking to spend time with you in the silence. Another thing she said is when you find peace in your heart the Thorns on Your Soul will disappear, they will fade away like a bad dream when you wake up in the fresh morning on a wonderful day. Don't give up, she said then I asked why it has to be that way… why we are suppose to suffer all this? The answer was “we have created all this mess in our life and no one else can clean it up but you… with time those hard lessons will disappear, but for now you have learned to be centered at all times. Not all is suffering as suffering is only an illusion, when you my dear friend, accept life as an illusion you’ll become free and then the roses in your garden will grow with no thorns that can hurt you. Still, some roses in my garden can hurt, but it is not the same anymore… as I meditate my resistant to see the Powerful Presence that I am and the life I can live is becoming smaller and smaller… learning to live your life from within is not just one morning you wake up open your eyes and there it is!! For some of us… the ones that like to control every move, every little detail like Carlos Castaneda before his encounter with Don Juan the Chaman... Change can take a little longer. 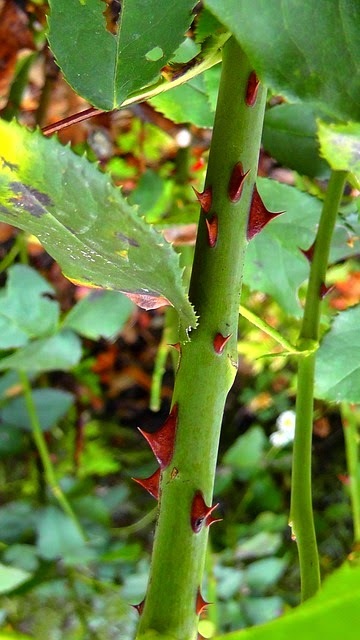 The Thorns on our Spiritual Path can be taken off only if you decide to… do not try to be like your Master as every experience is different… sometimes the Way or Road you avoid is the one that takes you to your lesson and so… home.